It seems lately that the convenience of the chubby pencil are popping up in every brand. Whilst most aren't as full coverage as a straight up lipstick, you still get a hint of buildable colour with a moisturising finish. Jelly Pong Pong have recently released their take on the pencil trend. This is their 'Lip Blush'* in one of the two colours they currently offer. 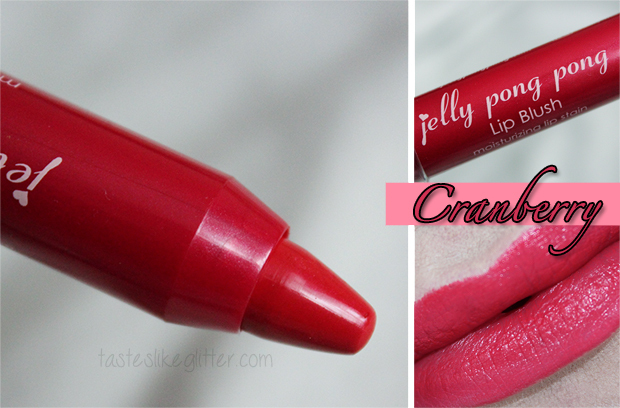 A moisturizing lip stain that tints your lips with just the right amount of juicy colour and hydrates like a balm. Apply liberally, purse and let the silky lightweight texture melt onto your lips. Made with beeswax and ceresin wax for a sheer, smooth application. Whilst these pencils won't shift my love for an old fashioned lipstick, one of my favourite reasons for liking them is that you can control how opaque and bold you want the colour. Perfect if you're easing yourself in! For my swatch I went all out. Even just one swipe with this leaves behind a light berry hue. Going over it several times really brings the colour but doesn't look at all patchy or affect wear time. I find with pencils if you apply and let it dry for a little while, when you do go to drink or eat you get a lot less transfer. This easily last for 4+ hours even with drinking and eating. It does start to fade off slightly after this time but leaves behind a slight stain. The only thing I'm not a fan of is the price. It's quite a lot when the range only has two shades. Whereas you could get the Revlon Just Bitten (with .2g more) for £7.99 and it comes in seven shades.